I had hoped I was through with this topic, but evidently not. The left-side reverse angled parking on Second Avenue in front of the Albany Post Office continues to stump at least some drivers, including the one who parked that silver car. I could not help but notice this nose-in parker as I went by on the bike about 10 to 5 on Thursday. It was odd, in a way. Because for some weeks now, all the vehicles I had seen there showed that their drivers had not only seen the sign but also mastered the art of backing into an angled space on the left side of a one-way street. Chances are there will be the occasional nose-in parker in that block for a long time to come. Why? Because reverse parking on the left is unusual, and for some people it’s near impossible because they cannot see the lines on the pavement. 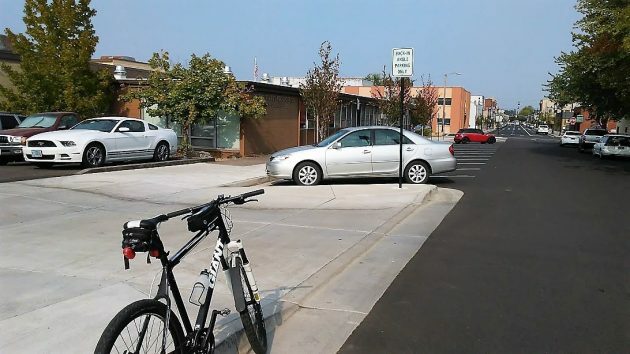 The city decided on this parking layout on the grounds that experts consider it to be safer. It doesn’t seem safer when you’re stuck behind a vehicle that’s sideways in the lane while the driver goes back and forth trying to hit the middle of a space. It also doesn’t seem safer when you’re pulling out but can’t see to your right rear because of obstructions in the car, like a door post and passenger head support, or a van or pickup in the next space. As usual, some idiot can’t handle it. Luckily ignorance isn’t a good legal defense. Post someone down there to write tickets and we can fund CARA. If you cant handle backing into the space you cant handle backing out. Turn in your license. I deal with it by never, ever parking in those wrong-way, back-in spaces. And, I’ll bet most people who use the Albany Post Office never use them either. I don’t see an issue with the back-in parking other then, the drivers who won’t or, can’t Using my mirrors is no more an issue then is the backing out. I had a brief conversation with a woman who explained her inability to turn sideways to park. She was elderly but as a 63 year old I believe I can ask the question: should we dumb down, based on her deteriorating driving skills or, is there another answer? Admittedly if the parking were on the right side of the street it would be easier but it’s not. I question the safety of this person I chatted with, backing into traffi or, for that matter driving at all. As we mature there are certainly trade offs. Hopefully I’ll have the wisdom to know when it’s time not, to be behind the wheel. Last week there were 3 cars nose parked during the day. I planned to take a picture when I left the post office to send you, but by the time I got out of there 2 of them were gone so I didn’t bother. I often see more than one at a time. I figure people see someone else parked like that so they either assume it’s the correct way or that they won’t get in trouble if everyone else is doing it. It’s still a very common thing to see there. If you can’t swivel your head far enough to see backing out, then this also means you can’t safely move your head while driving and you shouldn’t be on the road. Plus, mirrors are a limited view and blind spots often come into play. I like that. Either way of parking is difficult. Ha ha! TC just granted us permission to park East/West taking up 2 maybe 3 spots. Did you clear that with the parking enforcement? LOL!!!! I had the sad occasion to park there a couple of weeks ago. It was very awkward to back in as you can’t see the lines. When I got ready to leave an extended crew cab truck was to my right which meant that I had zero visibility. And if I can’t see them, they most likely can’t see me. As for nose-in parkers. Come on people, it’s clearly marked as a one-way street! Just another reason why not to shop downtown. Emma’s, the new coffee shop, and a couple of times a year to eat and my hairdresser are the only reason I go downtown so that tells you how many times a year I go downtown. Good for you if you find back in parking no problem. I do find it a problem and will wait for a spot to open in the parking lot. I have watched other drivers back in, pull forward, back in, pull forward and back in again trying to get into the space correctly. It would take me more time to back in park, then it does, to pull into a space and to go in to check my mail. If you put it to a vote-I vote pull forward parking. to hjanon typical distortion from you. did not advocate ignoring the parking lines at all.